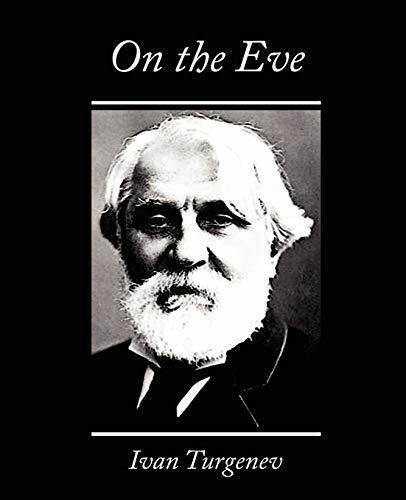 Turgenev was a major 19th century Russian novelist. His novel Fathers and Sons is his best-known work. In 1859 On the Eve was written about a quiet Russian household and a girl's soul. To the Russian reader this is also a penetrating look at the destiny of Russian in the 1850's. A country must weather hard fought battles in order for it to become a peaceful place to live. Ivan Sergeyevich Turgenev was born in 1818 in the Province of Orel, and suffered during his childhood from a tyrannical mother. After the family had moved to Moscow in 1827 he entered Petersburg University where he studied philosophy. When he was nineteen he published his first poems and, convinced that Europe contained the source of real knowledge, went to the University of Berlin. After two years he returned to Russia and took his degree at the University of Moscow. In 1843 he fell in love with Pauline Garcia-Viardot, a young Spanish singer, who influenced the rest of his life; he followed her on her singing tours in Europe and spent long periods in the French house of herself and her husband, both of whom accepted him as a family friend. He sent his daughter by a sempstress to be brought up among the Viardot children. After 1856 he lived mostly abroad, and he became the first Russian writer to gain a wide reputation in Europe; he was a well-known figure in Parisian literary circles, where his friends included Flaubert and the Goncourt brothers, and an honorary degree was conferred on him at Oxford. His series of six novels reflect a period of Russian life from 1830s to the 1870s: they are Rudin (1855), A House of Gentlefolk (1858), On the Eve (1859; a Penguin Classic), Fathers and Sons (1861), Smoke (1867) and Virgin Soil (1876). He also wrote plays, which include the comedy A Month in the Country; short stories and Sketches from a Hunter’s Album (a Penguin Classic); and literary essays and memoirs. He died in Paris in 1883 after being ill for a year, and was buried in Russia.